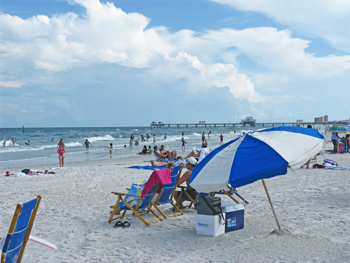 The Clearwater Florida beaches are continually ranked in the top Florida beaches by travel authorities. Clearwater FL is the Spring Break capital on the Florida Gulf Coast. It's famous beach is a 4-mile stretch of beautiful sugary white sand that runs from Clearwater Pass to the south, all the way northward to Caladesi Island. 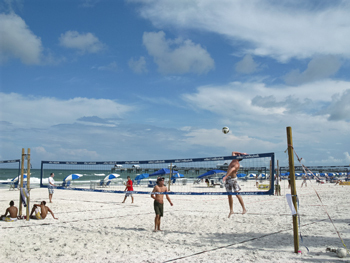 Clearwater Beach is divided into three distinct areas, although there are no strict boundaries...just distinct changes in the groups and activities along the beach. Pier 60 is the acknowledged division of the Clearwater Florida beaches with South Beach lying south of The Pier and North Beach of course, to the north. As one of the top Florida beaches, you'd expect Clearwater Beach to be clean, conducive to activity, have quality facilities, and be safe. You will not be disappointed. 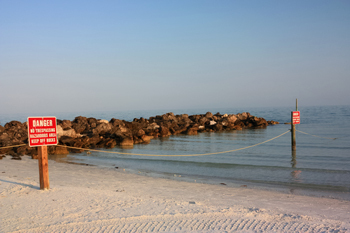 The distinction of the Clearwater Florida beaches begins right at the Clearwater Pass jetty. Please do not be put off by this photo with the red danger signs. This is a very small portion of a full half-mile of the Florida Gulf Coast between South Beach and Pier 60. The Beach Patrol constantly monitors the municipal access areas south of North Beach. They do not put up with any nonsense. The primary folks using this stretch of beach are families with children and couples who have been married for several years. There are lots of Frisbees, paddle-ball games, and football tossing going on down here. Kids run in and out of the water while parents watch them from aluminum beach chairs and well-stocked coolers of pop and sandwiches. There are an amazing abundance of cabana umbrellas to rent here. However, if you want to rent some watercraft, you'll have to walk up to Pier 60 Beach. The target age group on this section of Clearwater Beach is 16-30. Athletic-looking guys and girls mingle in a continuous dynamic of approaching someone new, playing volleyball, and relaxing in conversation. There are more bikinis here than anywhere else on the Florida Gulf Coast. During Spring Break, the crush of college and high school kids is overwhelming. Is it any wonder this is one of the top Florida beaches? It is almost like having all of the fans at the Rose Bowl come down from the stands to meet each other on the field. Pick up games are just as frequent as basketball competition in the inner-city. You will see some amazing athletes...both male and female. Talented high school kids who can climb air, mix it up with current and former college players. Mixed-doubles can be fierce, with female athletes providing both finesse and power. Don't despair though, there are all levels playing. You'll see guys in their 30's, who could get beat by the local junior high team, having just as much fun as the top players. The difference in beach-goers and the energy level of those on North Beach, as compared to the crowd at Pier 60 Beach, is like comparing Perry Como to Mick Jaggar. Once you get about 400 meters north of The Pier, you instantly recognize the relaxing calm of this segment of beach along the Florida Gulf Coast. This is where retirees and couples whose children are all out of the house come to lounge in the sunshine or walk along the pristine surf toward Caladesi Island. The primary reason for the calming atmosphere and absence of young people is that North Beach is an exclusive residential area. 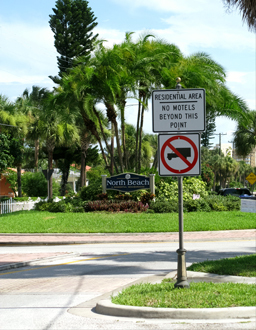 As you can see from the helpful sign, there are no motels or accommodations here. There is no parking for public beach access as this is all private property. Also, there are no lifeguard stands on North Beach. Walking...reading...and napping in the great Florida sunshine are the main activities here. Sure, you might have to lug your beach chair and cooler a bit to get to North Beach, but the peace and solitude are well worth it. 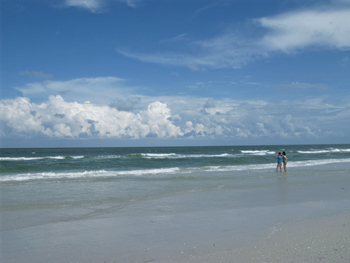 The Clearwater Florida beaches are connected, but distinctive. They have something for everyone. Year after year, the powdery white sands of Clearwater FL are rated as one of the top Florida beaches by one travel magazine or another. I hope you are able to experience them on your next Florida beach vacation. When is Stingray Season on the Clearwater Florida Beaches?